Like a freshly-baked croissant commanding you from across a busy street, converting online passers-by requires a simple law: attraction. Without the fruits of well-scented pastries and lovely shop assistants, online retailers need to employ a host of alternative marketing tools to get new prospects shopping. Once someone has subscribed to your brand there's a very narrow window to make the most of the heightened period of engagement and lock down the holy, almighty, SACRED first sale and lay the foundations of future engagement. The moment a visitor discovers your online store and signs up to your newsletter is hugely important: it marks the first step towards a new, potentially prosperous (and lifelong) friendship. 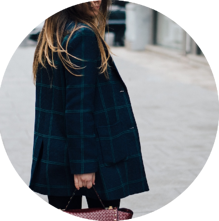 Online shopping is no place for a slow-burning, 10-year-office-crush-to-husband kind of thing. A welcome email's MO is simple, yet crucial: greet, schmooze, sell. With average open rates somewhere between 50 and 86 per cent, it’s crucial that your initial messaging lays the foundations for future engagement, sets expectations and paves the way for that all important first sale. 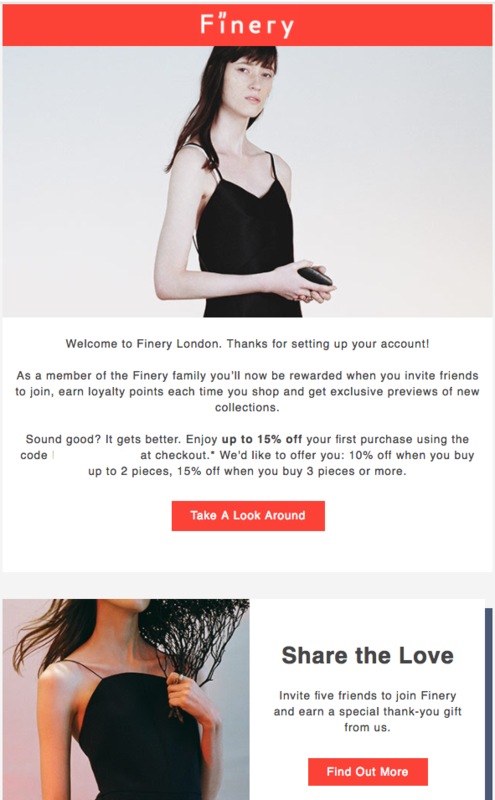 Finery's welcome message manages to: reinforce the benefits of signing up with the brand, offer a cheeky incentive and encourage the recipient to "share the love". Essentially, welcome emails need to embody all the attributes of an energetic, well-informed and passionate (real life) sales assistant: spearheading key brand values and personality, woven together with clear CTAs and bold incentives, to encourage activity from the very beginning. If your first welcome email doesn't seem to prompt any interest or purchase from your lead, there's always your follow up message. 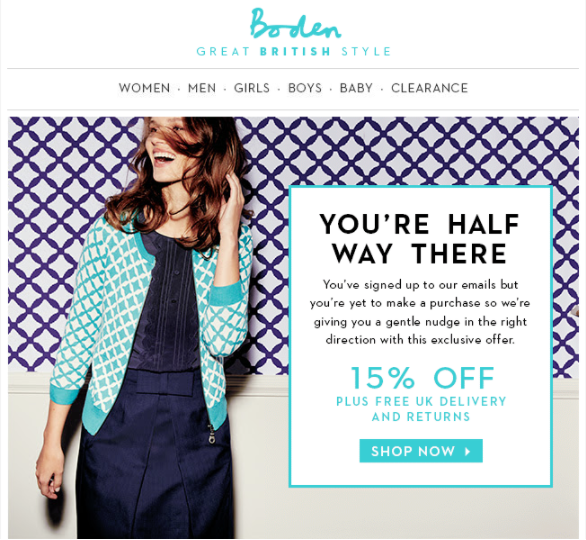 Take a look at (the always beautiful) Boden, who targets yet-to-shop newbies with a highly targeted message that's sent exactly three months after the first welcome message. 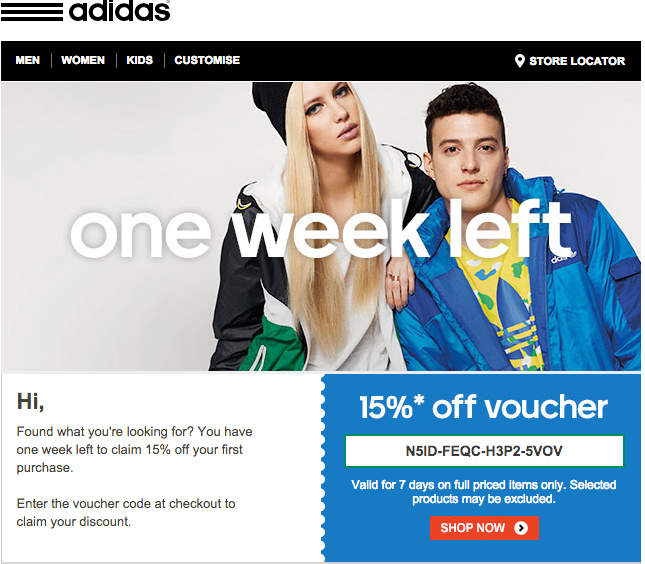 Whether you decide to send a single email or multiple messages to welcome new subscribers is up to you; but to show you how a longer campaign can look, here's a quick look at Adidas' four-part series. There’s nothing like a cheeky, time-based temptation to encourage that first sale: something Adidas employs as its central hook to get sales within its four-part welcome series. 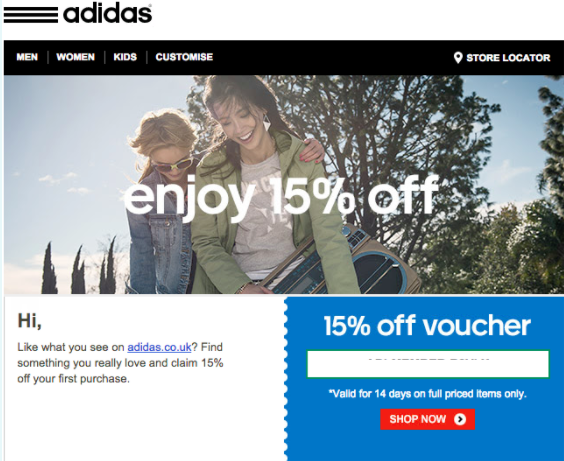 The sports brand uses the lure of "15% off" for the first sale throughout its welcome series to trigger activity: resending to non-shoppers over the course of 14 days, slightly tweaking its messaging to instill an incremental sense of urgency. Email one introduces the discounted incentive with a cheeky time-based caveat in a bid to encourage activity by instilling the sense of urgency. Sent a week after email one, the tone and bold imagery of email two sets to further stir the growing sense of urgency to get subscribers shopping. The countdown is on in email three - with a direct and very specific time-based deadline looming. This email encourages shopping by pushing top-selling items (complimented by glowing social proof) and a "find your store" function to boost brand touchpoints and promote offline shopping in a bid to scoop sales. Email four: the last hurrah. 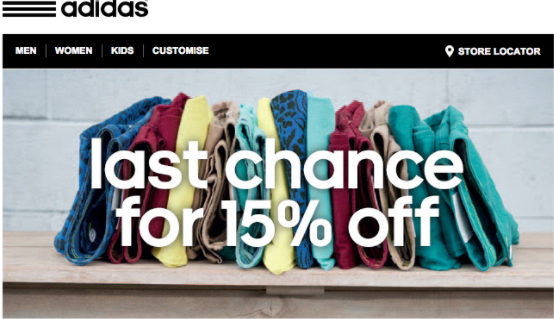 The friendly guys at Adidas give non-shoppers ONE last chance to claim their welcoming prize. Automated emails present a unique opportunity to react and respond to consumer behaviour at any stage in the customer journey. Research from the e-tailing group found that 41 per cent of people said they purchase more from retailers that send personalised emails based on past browsing and buying behaviour. Segmenting your email marketing list into new subscribers who have yet to shop, but are displaying on-site activity, will let you deliver tailored content during an important period of engagement. Cart and browse abandonment emails enable you to deliver visual reminders of viewed items and deliver recommendations based on similar attributes, categories and themes - thus remaining relevant. Zumiez's abandoned cart message clearly outlines the forgotten items with clear visuals, product descriptions and a prominent "Add to bag" CTA. Bonus points for the product recommendations under "top picks", as well as the "new arrivals" section at the bottom. By cross-promoting similar products in a triggered email, brands can increase the likelihood of a recipient clicking through. As this email has been sent to a lead (yet to make a purchase), the "find a store near you" CTA is a great way to encourage offline store visits and learn more about a consumer for future correspondence. 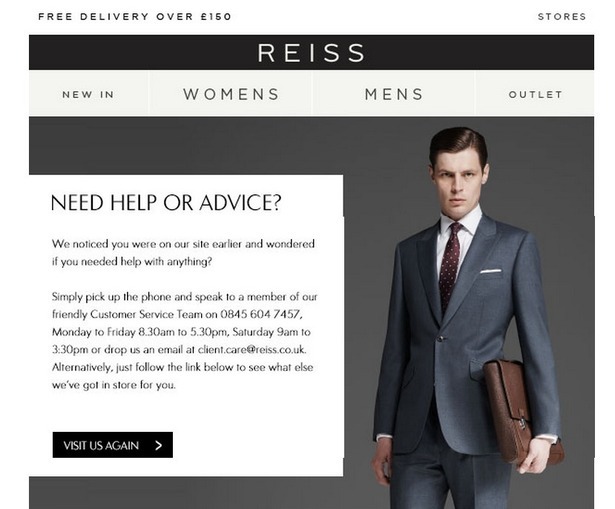 Reiss use browsing behaviour to link to their customer support in a bid to clinch a sale. You wouldn't buy a car without being sold the dream by an energetic, commission-hungry salesperson - so why shop online without the sales pitch? Either by using your website to list your competitive perks or through your email marketing: highlight the benefits of shopping with your brand and don’t shy away from the details to lure new prospects onto the buy button. Take River Island: the fashion brand uses a carousel-style header within their email to outline their delivery perks in an engaging, attention-grabbing style. 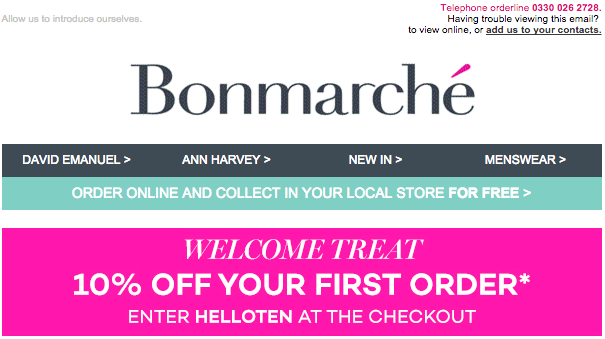 Similarly, Bonmarché uses the top of their welcome message to highlight key brand USPs , perks and customer service (along with a nice tempting treat). Every little nudge along the sales decision making process is a step closer to profit - with online users 70% more likely to convert when they're retargeted. In a cross-channel world, it's wise to target your new prospects in a variety of ways on a variety of platforms if you want to boost ROI, customer retention and customer spend rates. Facebook custom audiences is wonderful to use in cahoots with your welcome email strategy to increase your digital footprint during a crucial window of a user's decision-making journey. 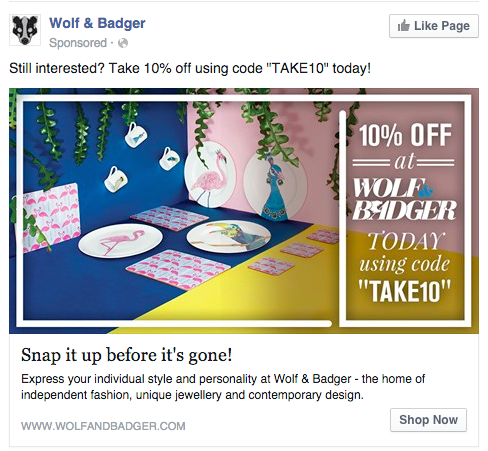 Take this Wolf and Badger Facebook ad, for example. Recognising my activity on-site and that I'm yet to make a purchase, they delivered this highly-targeted, time-based ad, complete with a discounted incentive and an invitation to like their page. Custom audiences enable advertisers to target their ads to a specific set of people with whom they have already established a relationship on/off Facebook - they don't always have to include an incentive - they can simply act as a visual reminder to purchase, keeping the product and brand alive in the mind's eye of your new online prospect. Audiences can be defined by either email address, phone numbers, names, date of birth, gender, locations, app user IDs, Apple's Advertising Identifier (IDFA), or Android's advertising ID. You can setup custom audience campaigns directly from the Facebook and Twitter ad platforms. Just upload your customers in groups (always remember to remove them once they have made their first purchase). Need any help setting up custom audiences? Check out Facebook's guidelines here. Ecommerce is a competitive industry known for low conversion rates, so standing out is essential. Ecommerce retailers need to employ a host of persuasive tactics to tempt prospects along the sales funnel: using key brand messaging, user behaviour and important marketing channels to target users at the right time with relevant messaging to boost engagement and win sales.